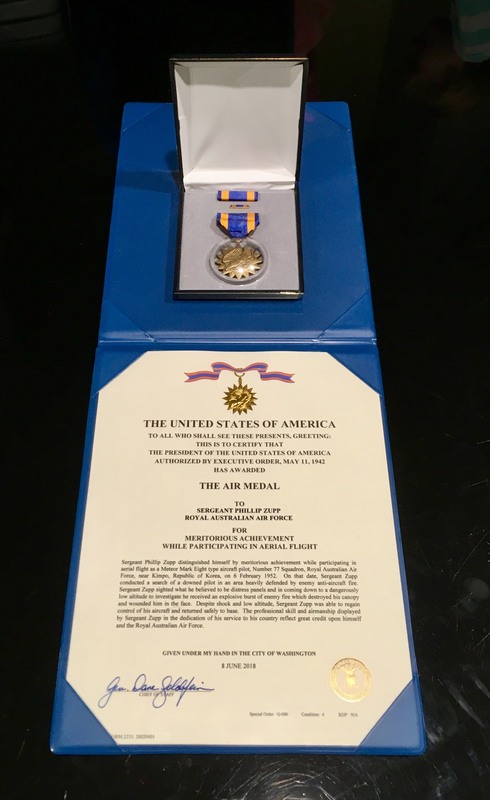 The official citation and United States Air Medal for Phillip Zupp. 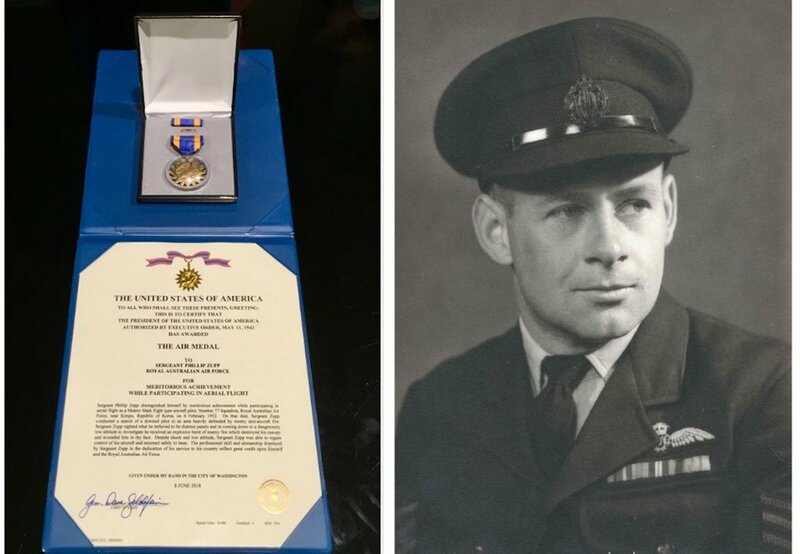 The United States government has posthumously awarded a US Air Medal to Royal Australian Air Force Flying Officer Phillip Zupp. Zupp’s son and Australian Aviation Flying Editor Owen Zupp accepted the award from the United States Charge D’Affaires to Australia James Caruso at an official presentation attended by Chief of Defence Force Air Chief Marshal Mark Binskin at the Australian War Memorial in Canberra on Tuesday evening. The official citation referenced Phillip Zupp’s efforts on February 6 1952, when he was a member of RAAF’s Number 77 Squadron participating in “aerial flight” in a Meteor F.8 jet fighter near Kimpo, South Korea. “On that date, Sergeant Zupp conducted a search for a downed pilot in an area heavily defended by enemy anti-aircraft fire,” the official citation reads. “Sergeant Zupp sighted what he believed to be distress panels and in coming down to a dangerously low altitude to investigate he received an explosive burst of enemy fire which destroyed his canopy and wounded him in the face. In Korea, Phillip Zupp, who was later promoted to Flying Officer, flew 201 fighter missions and was Mentioned in Despatches by the Commonwealth. Zupp’s story, which apart from the events of February 6 1952 also includes, among other achievements, active service during World War 2 with the Australian Army’s 2/10 Cavalry Commando Squadron and being stationed in Hiroshima, Japan with the British Commonwealth Occupation Force (BCOF) only months after the detonation of the atomic bomb there, has been chronicled in a Owen Zupp’s book Without Precedent. Phillip Zupp and the book about his life written by Owen Zupp. In a statement, the Zupp family thanked Air Chief Marshal Binskin and his staff for their “tireless efforts in seeing Flying Officer Zupp’s service recognised in this way”. What an amazing story and a true Australian hero. Congratulations on just5 recognition, even though it is overrdue. Owen Zupp’s book about his dad is very good and worth reading. Owen’s stories in Australian Aviation are always a highlight to me as also are his other books on aviation. Sincere congratulations to you and your family Owen. When I read Owen’s book on his father the first time, I could hardly put the book down and went on to read it a second time. I always look forward to reading Owen’s stories in Australian Aviation and can’t wait to read the book he is writing about his mother. Thanks so very much everyone. Our family was very humbled by the award. He was a very quiet bloke, but we are very proud of what he achieved in his life. Thank you.